Custom Crystals Jewelry Handmade for any occasion with Swarovski 5mm Siam Red Crystals & Japanese Glass Beads handmade Pendant & Can Make in any Color of your choice Pendant is accented in good quality rhodium silver chain perfect for your outfit wear & appropriate for the party or to gift to your love one on the very special occasion. Handmade Exquisite Pendant in Swarovski Crystals. 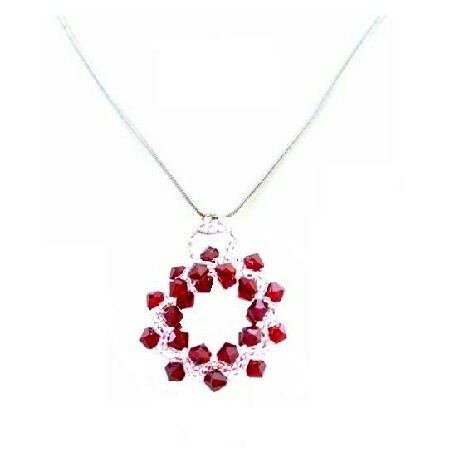 Buy Siam Red & Japanese Glass Beads Pendant w/ Rhodium Silver Chain , sold & shipped by Fashion Jewelry For Everyone where you can shop online for Leading Online Retailer for Indian Fashion Jewelry. This Necklace Sets collection has been tagged as Beads Pendant,Japaneses Beads Pendant,Red Pendant Chain,Japanese Beads,Siam Pendant Chain,Red Beads Pendant,Beads,Siam,.